While the holidays are meant to be a joyful time for us to spend with friends and family, they are also a joyful time for credit card thieves. As we hustle and bustle trying to find the perfect gift for that special someone, the bad guys are stealing our credit card information! 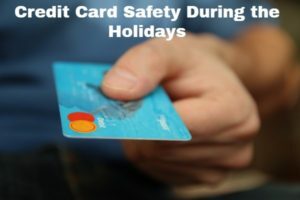 Credit card and electronic payment fraud can quickly put a damper on the holiday spirit, so here are my five top tips on keeping your credit card and other payment information safe at the mall and online. Electronic wallet services from vendors like Google, Apple, and Samsung are in widespread use internationally and catching on quickly in the US. These services are safer in many ways than traditional credit cards because they encrypt payment information before sending it to the point of sale device. You can touch your phone to a receiver or magnetic stripe reader, and your payment is sent. But, as with any new technology, there are still vulnerabilities. Although secure “tokens” are used for the payment, it is still possible to intercept the network traffic going on between your phone and the token provider and the receiver. Some “white hat” hackers (the good guys that try to figure out what the bad guys are doing) have determined that attackers can replay or tamper with transaction data to change the amount or currency being paid. This can be done without any sophisticated equipment or skills. Although many consumers like to use their debit cards and not accrue credit card balances, they don’t realize that those debit card purchases aren’t protected the same way as those made using a credit card. That’s because the laws governing credit cards are different than those for debit cards. In both cases, a consumer’s liability is capped at $50, but with many debit cards you only have 2 business days to dispute a charge! In contrast, credit card issuers provide 60 days to dispute a charge. Credit card issuers also provide purchase protection and dispute resolution if you’re unhappy with a product and not getting help from the seller. For consumers who are able to pay their credit card bills on time without building up debt, credit cards are more secure and offer more consumer protection than debit cards. Never forget that a debit card is a direct line into your bank account, and a cyber criminal could drain that account with the right tools and information. With the ease of obtaining credit cards, it makes sense to have different cards for different types of purchases. While I’m not advocating racking up debt, or spending up to the credit limit, you might consider having a card with a low credit limit for online purchases or even for particular sites. That way, if your card information was ever compromised, the thief couldn’t spend much and you’d potentially know which site wasn’t carefully securing your information. And while you’re shopping online, make sure the site is secured with “https” in the address. You’ll also see a little padlock symbol in the browser bar. This means that the site uses something called secure sockets layer (SSL) to encrypt the data that you send, like your credit card information. Don’t ever enter your credit card information into a site without that symbol. If you’ve made a lot of purchases in many different stores over the holidays, or you’ve done a lot of dining out, take the extra precaution of calling your credit card provider and requesting a new card. Believe me, they will be more than happy to send you one. It’s much less expensive for them to put a new, little piece of plastic in the mail than it is for them to address any fraudulent purchases. Remember, that stolen credit card numbers might not show up in fraudulent activities for months. Many thieves don’t use the cards themselves, but resell them and that takes time. If you think your card number could be at risk, you could stop that whole business in its tracks if you request a new card. And rather than waiting for your card’s expiration date, you could even request one every 6 months to really be safe. In-store apps have taken the shopping experience to a whole new level by offering coupons, product information, code scanning and expedited check out. But consider that there are risks as well. Not all apps, even in the Android or Apple stores are what they appear to be. Don’t just download an app because it looks like it’s from your favorite retailer – look at the information and read the reviews. Poor grammar or spelling, along with only positive reviews could be a red flag that the app is malware. There are a lot of myths out there about electronic pickpocketing and thieves being able to steal your card data with easy-to-obtain receivers. Most of these are false, but plenty of credit card scams and threats are real. Remember, credit card theft is big business, and the bad guys are always looking for an opening or to trick you into giving your credit card information willingly. Be smart about how you handle your credit cards and you’ll be well on your way to a peaceful holiday season.